Butterflies are a-flutter in this 500-piece puzzle from Springbok! 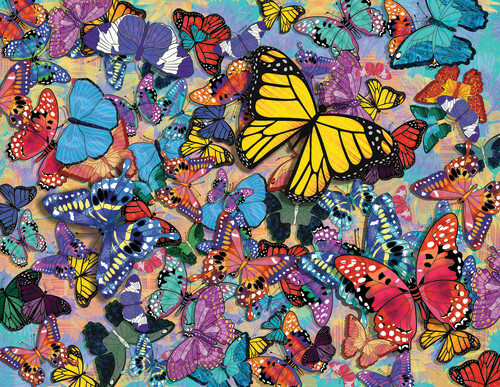 Each colorful butterfly is unique, making this a fun and challenging puzzle to complete. This puzzle was a blast to do. The colors are so vibrant. It turned out to be more challenging than I expected but was fun. This puzzle is so fun to put together and when I was done I had a cute picture to frame and hang up. I enjoy this puzzle and found it very challenging with the repeating patterns. The quality of the puzzle pieces and vivid colors made it one worth saving for others to enjoy.